1. It all started innocently when Drake began attending Serena's tennis matches back in 2011. Back in 2011, Drake let everyone know that he had a thing for the US tennis champion when he posted this very suggestive message on Twitter. The tweet also hinted the pair were spending time together off the court. 3. Remember when Drake mentioned Serena Williams in a song? It was clear the pair had struck up a flirty relationship when Drake name-dropped Serena on his 'Nothing Was The Same' track 'Worst Behaviour'. Adding to his previous suggestion the two spent time together, he rapped: "I'm with my whole set/Tennis matches at the crib/ I swear I could beat Serena when she playin' with her left." 4. Serena Williams' ex-boyfriend Common did, and he fired off a diss track at Drake. 5. And Drake fired back at Common with one of his hottest verses yet. After hearing Common's diss song, Drizzy wasn't impressed. First he hit back in an interview, adding that although he sings he "ain't no b**ch" and challenged Common to say those comments to his face. Drake then unleashed one of his greatest verses on Rick Ross' 2011 song 'Stay Schemin' firing off lyrics such as: "shawty wanna tell me secrets about a rap n*gga/I told that b**ch its more attractive when you hold it down." 6. Common confirmed that he dissed Drake because of his relationship with Serena Williams. 7. Fast-forward to 2015 and Drizzy was spotted paying very close attention to Serena at Wimbledon. 8. He then celebrated her Wimbledon win on Instagram. 9. He continued to support Serena from the stands at a number of her matches around the world. Things began heating up between Drake and Serena when they were spotted making out in the VIP section of a restaurant in Cincinnati, US. Photos and video footage of the moment began circulating on the Internet. Video footage emerged of Drizzy and Serena Williams kissing as they left what appeared to be a restaurant or a hotel. Drake can be seen walking her to an awaiting car. 12. Drake then released a freestyle that posed more questions. Did they break up? 13. Serena Williams and Kim Kardashian sipped tea. 14. 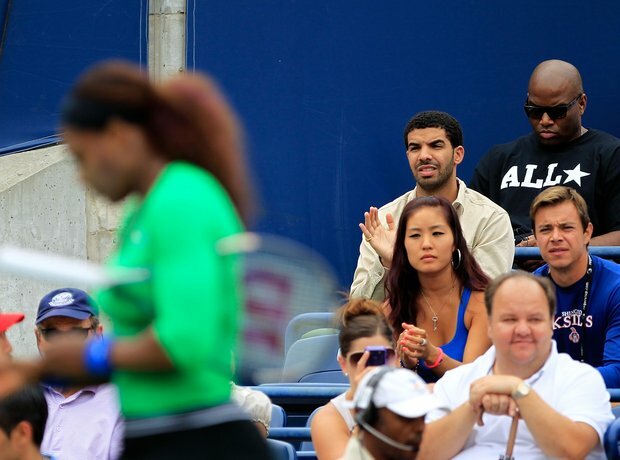 Drake was then spotted at Serena Williams' biggest match of the year in 2015. 15. Drake was spotted watching Serena Willams' at Wimbledon 2018.